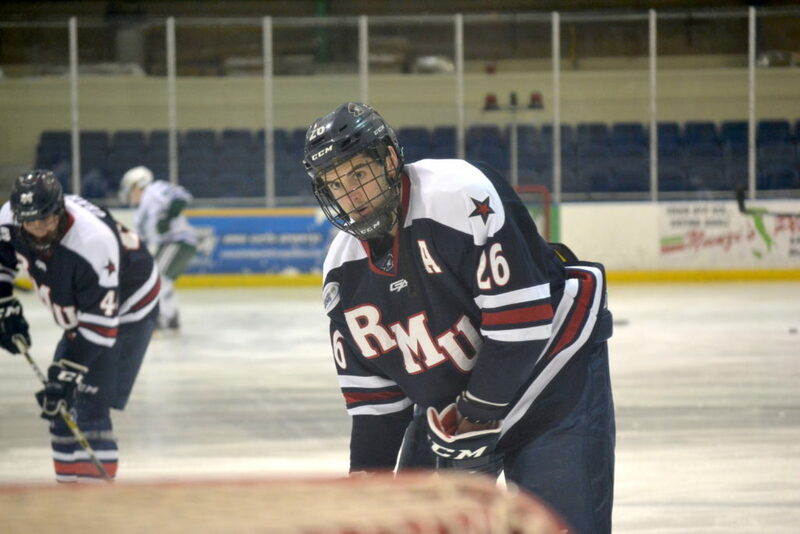 Former Robert Morris forward Daniel Leavens has re-signed with the ECHL’s Wheeling Nailers, the team announced Monday. The Nailers are the Double-A affiliate of the Pittsburgh Penguins. Leavens played in seven games for the Nailers in the 2016-17 after finishing his career at Robert Morris. He scored five goals and three assists for eight points in seven professional games. The small sample was enough for both sides to want to extend it for a full season and Leavens has been on the Nailers’ radar since early in the summer. At Robert Morris, Leavens finished eighth in school history with 108 points. He was the tenth Colonials player ever to score 100 points. Leavens was joined by former RMU player Cody Wydo on the Nailers in 2016-17. Wydo was given a qualifying offer by the Nailers but has not signed a contract yet for the upcoming season. They are among the nine former Colonials to play for the Nailers since the program began in 2004-05. The Nailers play just about an hour southwest of RMU’s Moon campus. Pittsburgh Hockey Digest caught up with Leavens about the journey from college hockey to the pros and why he wanted to re-sign with the Nailers. Here is a lightly edited transcript of the conversation. PHD: What made you want to re-sign in Wheeling? DL: A small part of it would be the proximity to RMU. It’s an area that I’m comfortable in. It’s an hour down the road and a place that I played a few games last year. It’s a familiarity with the coaching staff and the organization. When I was there, the guys were great. I really enjoyed my time there. I was treated well. It was a place where I was really wanted. You have to go to places where people want you there. I felt like it was a perfect position for me to return to Wheeling. PHD: What was your relationship like with Nailers coach Jeff Christian? It’s been awesome. He’s an easy guy to work with. It made the adjustment a lot easier for me. PHD: What was it like making the transition from collegiate to professional hockey at the end of last season? DL: The support system at RMU, and that’s not just the coaching staff, that goes for the alumni that I played with there before, the graduating classes before me that moved on to play pro, we all kind of kept in touch. That makes it easy because they tell you what pro hockey is like, what the big differences are, what the challenges are. I obviously hadn’t played, but I had an idea from talking to older guys what I was getting into. The first game, you’re obviously very nervous. You don’t know how it’s going to go. It ended up being a good night for me (Leavens scored a goal in his first pro game) and a good seven games that I had there. I just tried to run with it. I didn’t want to think too much. I did my thing, played my game and hoped for the best. PHD: Was there any one specific thing that was a difficult part of the transition? DL: The fact that you’re not just playing two games a week. You’re playing three games in three nights and sometimes four games in five nights. In terms of the game itself, probably just the speed. It’s not that much different than college. College hockey is a fast-paced game. Everyone goes full-tilt all the time. But it’s the quality of the plays guys are making at that speed. You don’t see guys missing passes. Even in practice, a missed pass is just unacceptable. Not that they were acceptable in college, but every one just has that much more on them. Older guys, bigger guys, stronger guys. PHD: How important was it to have that success at the end of last season? DL: You don’t want to get too comfortable. It’s a good league. You watch guys have a good couple weeks and maybe they get overconfident and it hurts them. I’m definitely taking it and using it as a positive, but I’m also realizing that it was just seven games and I have to get off to a good start again next season and prove that I’m capable of producing at that level. PHD: What are you focusing on this summer as areas for potential improvement? DL: With my off-ice trainer, I’m really doing a lot of conditioning, footwork and agility training and then on the ice, I’m doing a lot of power skating. I really trying to work on my speed and my skating. I think that’s one thing that I need to improve to continue moving up in the pro hockey world to continue to have success. I’m putting in the work. I’m doing what I can to get better. Hopefully, it all plays out come October. PHD: Do you have any goals for this coming season? DL: I want to go in and continue to build on what I started at the end of last season. Now that I’m locked in and all signed, I don’t have to worry about where I’ll be and I can just focus the rest of the summer on what I need to do to be the best player I can be come training camp. Once I’m there, hopefully, I’ll just keep going with how I started last year and continue to take strides as a player. Everyone’s goal is obviously to move up the ranks in pro hockey, but I’m kist taking it one day at a time.